Need a quick visit to the tropics? 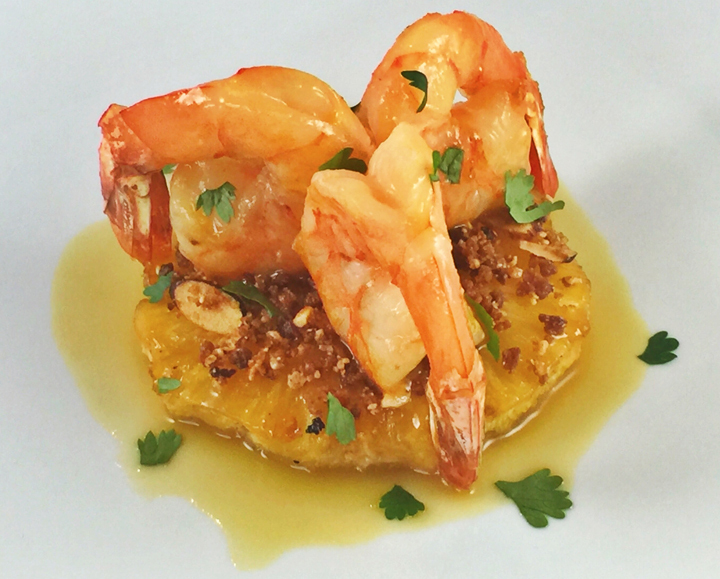 This recipe is your ticket to paradise – caramelized and smoked fresh pineapple rings with a delicious crunchy topping made with toasted coconut and almonds then finished with pan-sear shrimp tossed in caramelized pineapple sauce. 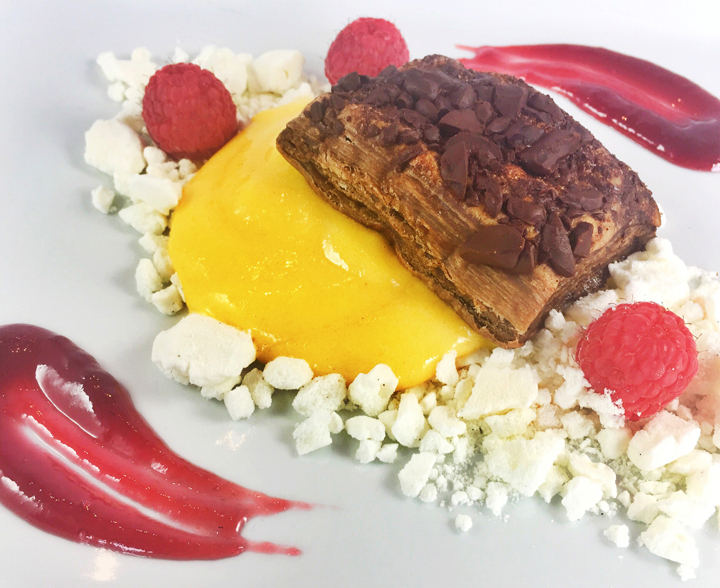 The Perfect Pureé of Nappa Valley Caramelized Pineapple Concentrate used in this recipe can be ordered online direct or through Amazon. If you don’t have a smoking gun, simply cook the pineapple on a grill with a handful of apple wood chips to get a nice smoky flavor. Preheat the oven to 375˚ F. In a large mixing bowl, combine the ingredient together and spread on a Silpat mat or parchment lined baking sheet. Bake for 20-22 minutes until golden, stirring every eight to ten minutes. Remove from the oven and cool completely. Process the mixture in the work bowl of a food processor until it becomes finely ground. Set aside. Preheat oven to 375˚F or heat a grill to high heat. Place pineapple rounds on a parchment-lined baking sheet. Whisk together the rum, brown sugar, and butter in a small bowl. Brush rum mixture onto pineapple. Roast until the liquid has evaporated and pineapple has caramelized about 30 minutes. Using a smoking gun, cold smoke the pineapple with apple wood chips. Or heat a BBQ to high heat, add applewood chips, and roast the pineapple turning frequently until cooked through and caramelized. Preheat the oven to 350˚ F. Peel and devein the shrimp. Retain the shrimp shells; place the shrimp back in the refrigerator. Add the shrimp shells to a quarter sheet tray and roast in the oven for 15 minutes. Pour the shells and any liquid on the sheet tray to a small 1 quart saucepan and cover with 1 cup of water. Bring to a simmer and reduce the liquid to 2 tablespoons. Strain and discard the shells saving the liquid. In another saucepan add the lemon juice, Perfect Pureé of Nappa Valley Caramelized Pineapple Concentrate, soy, and fresh ginger. Reduce the mixture to 1 cup. Strain the mixture through a fine mesh strainer, place back in a clean saucepan and then whisk in the shrimp liquid. Cover and keep warm. Over medium-high heat, cover just the surface of a large 12” sauté pan with olive oil. Sauté the shrimp in one layer for 1-1 ½ minutes per side, then add a ¼-½ cup of the sauce, tossing and sauté for one more minute then remove from the heat. Retain the remaining sauce for drizzle on the plates. In the center of a plate add a pineapple ring. Lightly press the coconut and almond topping into the pineapple. Top with the shrimp, spoon sauce over, and finish with cilantro leaves right before serving. *The Perfect Pureé of Nappa Valley products are available on Amazon or https://www.perfectpuree.com/shop/. Celebrate Memorial Day with summer’s perfect dessert – strawberries, fresh cake, and whipped cream. 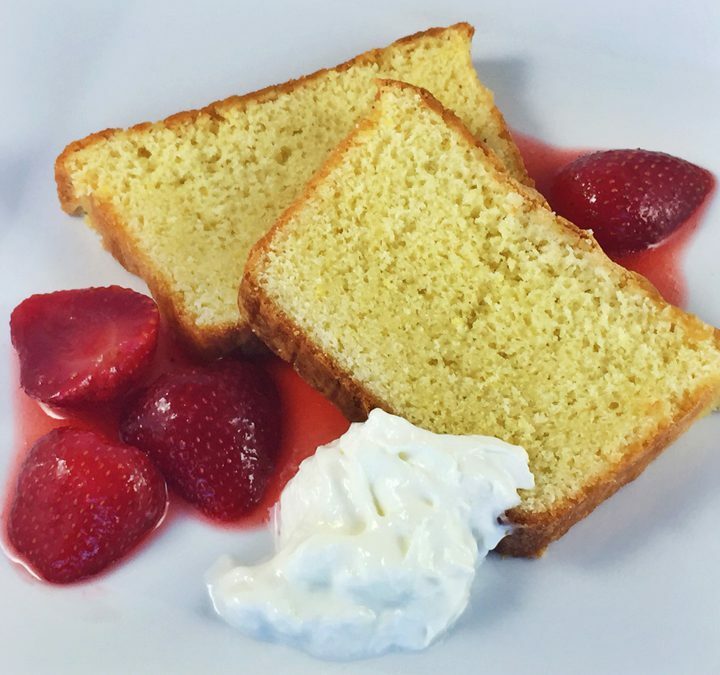 We added spicy ginger to this sweet little pound cake and served it with strawberries we compressed with fruit juice and ginger using a vacuum sealer. If you don’t own a vacuum sealer, we have also included instructions to make this dessert with macerated berries, which are just as delicious! This recipe uses Perfect Purée of Napa Valley Ginger Sour, which can be ordered online, or you can substitute with simple syrup. Preheat the oven to 350˚ F. Using 1 tablespoon of the softened butter, butter two 8 1/4- x – 4 1/2 – x 2 1/2 – inch loaf pans. Line with a long piece of parchment paper that extends over the sides of the pan. Butter the parchment and dust the inside with flour tapping out to remove any excess. Sift the flour, baking powder, ginger, and salt together. Put the sugar and lemon zest in the work bowl of a stand mixer and work them together with your fingers or a wooden spoon until the sugar and lemon zest is thoroughly combined. Add the butter to the sugar and using a stand mixer combine until the mixture is light in color and fluffy. Add the egg yolks and eggs, one at a time, combining them each into the mixture until thoroughly incorporated. Add the vanilla extract, cream, and Perfect Purée Ginger Sour into the mixer bowl and combine thoroughly. Using a wooden spoon or rubber spatula, add the dry ingredients in 3 to 4 additions until the batter is smooth and thick. Pour into the pans and smooth the tops with the rubber spatula. Bake for 60-70 minutes or until a cake tester comes out clean. Remove from the oven and cool 10 minutes. Then using the excess parchment, remove the cakes from the pans. Remove the parchment and place the cakes back on the rack to cool to room temperature. Slice and serve with the compressed berries and fresh whipped cream. Remove the stems and cut the berries in half. Remove one cup of strawberries; set the others aside. Chop the one cup of berries and add to a blender with the Perfect Purée Ginger Sour or simple syrup. Process until very smooth. Strain the liquid through a fine mesh sieve; discard solids. Add the strawberry halves to a chamber vacuum bag. Pour the liquid over the berries and seal with the vacuum to compress the berries. Refrigerate overnight. Remove the stems and cut the berries in half. Add the strawberry halves to a bowl. Pour the liquid over the berries and leave at room temperature for 3-4 hours. Refrigerate overnight. In a saucepan over medium heat add the sugar with ½ cup water. Bring to a simmer and stir until the sugar melts into the water. Remove from the heat and set aside to cool. If you enjoy a steak on the grill, you will love this alternative to beef. Rubbing lamb with a combination of fresh and dry herbs and spices, helps it cook up beautifully on the grill. To include delicious complimentary flavors, we added simple sautéed mint glazed vegetables and a parsley sauce created in a blender in just minutes. If you don’t see lamb leg steaks at the meat counter, ask your butcher to cut three-quarter inch steaks from the upper portion of the leg. Removed the steaks from the refrigerator. Crush with a mortar and pestle, or grind with a spice grinder, the coriander, fennel, and rosemary. Thoroughly combine with the garlic, pepper, and salt in a small bowl. Drizzle in the olive oil, mixing to make a thick paste. Rub both sides of the steaks with the paste and rest the steaks at room temperature for one hour. Prepare a grill to high heat then add the steaks and cook for 4-5 minute per side or to medium rare, 145˚ F. Remove from the grill, cover with foil, and rest the steaks for 15 minutes before serving with the sauce. Makes 4 servings. Combine the parsley, rosemary, lemon juice, and garlic in a blender. Pulse until finely chopped and then stream in the olive oil and blend until combined. Serve with the lamb steaks. In a saucepan over medium heat add the sugar with ½ cup water. Bring to a simmer and stir until the sugar melts into the water. Remove from the heat and add the mint leaves; set aside to cool about 30 minutes. When the sauce has cooled, strain the syrup through a fine-mesh sieve into a clean container to remove the mint. Set aside. Over medium heat, melt the butter in a 12” sauté pan. Add the carrots, lemon, mint simple syrup, and 1 teaspoon salt. Cook until fork tender, then increase the heat to simmer all the liquid away while turning the carrots until caramelized and lightly browned in spots. Season to taste with more salt and pepper. 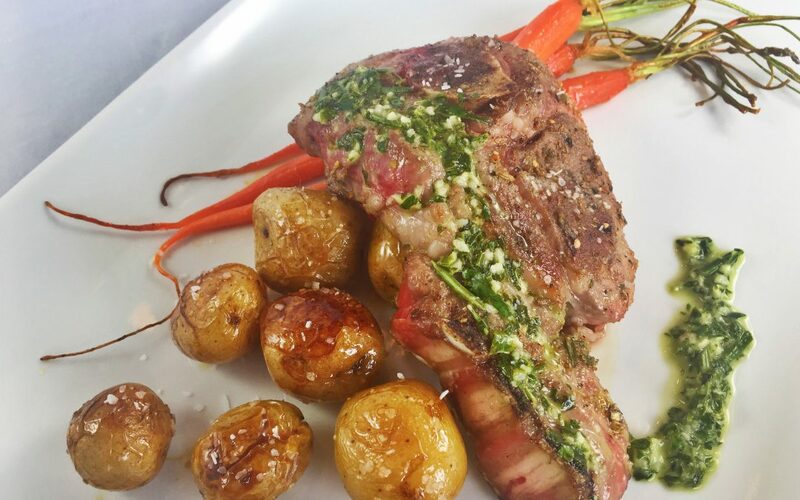 Serve with the lamb steaks. Scrub the potatoes clean, put them in a pot, and cover with 2-inches of water. Add 2 tablespoons of salt and bring the water to a boil. Turn down the heat to a gentle simmer and boil until the potatoes are easily pierced with a small thin knife. When cooked, strain and allow the moisture to evaporate off the surface of the potatoes. Heat a sauté pan over medium-high heat until hot; add the butter and melt. Add the mint syrup and cook until reduced about 5 minutes. Add the potatoes and cook, gently turning occasionally until all the liquid is gone and potatoes are turning golden. Sprinkle with more salt and serve with the lamb steaks.